With the baseball playoffs fast approaching and the football season in full swing, it still seems that LeBron James is everywhere. You have books on the market, movies on the way, heÃ¢â‚¬â„¢s at the Cowboys game, heÃ¢â‚¬â„¢s on the Daily Show. You canÃ¢â‚¬â„¢t even open your front door without LeBron being there selling you Nikes and clapping some chalk in the air. Now, if you know anything about this site, weÃ¢â‚¬â„¢re the foremost LeBron critics in America, having been on him from the start, ever since that first SI cover. But itÃ¢â‚¬â„¢s pretty incredible whatÃ¢â‚¬â„¢s happened since. And though we expect this to be an incredible year of frenzy over LeBronÃ¢â‚¬â„¢s Summer of 2010 free agency, itÃ¢â‚¬â„¢s sort of amazing that this has happened already. You simply canÃ¢â‚¬â„¢t get away from him. I have to admit, IÃ¢â‚¬â„¢m a little burned out on the guy, which I didnÃ¢â‚¬â„¢t think was possible. The King has obviously taken some cues from his friend Jay-Z, who has branched out of his field to make himself omnipresent. Commercials, award shows Ã¢â‚¬â€œ no Kanye Ã¢â‚¬â€œ talk shows, rap videos, the guy is everywhere. And thatÃ¢â‚¬â„¢s what you want, you want to be out there. IÃ¢â‚¬â„¢m no marketing guru, but if people get the idea that youÃ¢â‚¬â„¢re always around, that equals money. Every company wants in on that. As a result, basketball season or not, we get all LeBron, all the time. So yesterday, it was LeBron on Dave Letterman, who IÃ¢â‚¬â„¢m a huge fan of. And you see why the King is such a huge hit: HeÃ¢â‚¬â„¢s smooth as silk. My mom watched the video below and loved him. HeÃ¢â‚¬â„¢s got the looks, the grin, the sense of humor and the congenial attitude. And thatÃ¢â‚¬â„¢s what separates him from Jordan Ã¢â‚¬â€œ well, besides six championships, at least so far. JordanÃ¢â‚¬â„¢s personality was completely fabricated by corporations to gloss over the weaknesses in his temperament. LeBronÃ¢â‚¬â„¢s got that chill nature that makes things easy Ã¢â‚¬â€œ thereÃ¢â‚¬â„¢s not as much to cover up. Just watch Jordan on Oprah at left. (I, uh, watch her when she has basketball players on) Jordan presents an idea that is not only bitter, but completely ridiculous. And throughout the whole episode, JordanÃ¢â‚¬â„¢s social inadequacies are covered up by the personable Charles Barkley being there as a buffer. Check out BarkleyÃ¢â‚¬â„¢s face at the end of this video after a rare occasion that JordanÃ¢â‚¬â„¢s opinions are left unchecked. Then compare that to LeBron with Dave. HeÃ¢â‚¬â„¢s well-spoken, looks good in a suit, seems friendly and grounded and generally seems like heÃ¢â‚¬â„¢s having a good time. This is corporate gold, my friends. And New York is eating him up because of the fantasy Ã¢â‚¬â€œ which could become reality Ã¢â‚¬â€œ that heÃ¢â‚¬â„¢s going to come here next year. ItÃ¢â‚¬â„¢s like the city is dating him and fantasizing what it would be to marry him. And then, in conjunction with his movie, we have this music video from up-and-coming rapper Drake, featuring LilÃ¢â‚¬â„¢ Wayne, Kanye West and Eminem. Sidebar: This site knows a little hip-hop, so hereÃ¢â‚¬â„¢s the deal here: Eminem Ã¢â‚¬â€œ in 8 Mile mode Ã¢â‚¬â€œ kills it as usual. I like Drake and Kanye, actually, but like being on the court with LeBron, you canÃ¢â‚¬â„¢t shine when youÃ¢â‚¬â„¢re on a track with Em. ItÃ¢â‚¬â„¢s like Nas said about Jay-ZÃ¢â‚¬â„¢s Renegade: Em has a tendency to murder you on your ownÃ¢â‚¬Â¦ song. 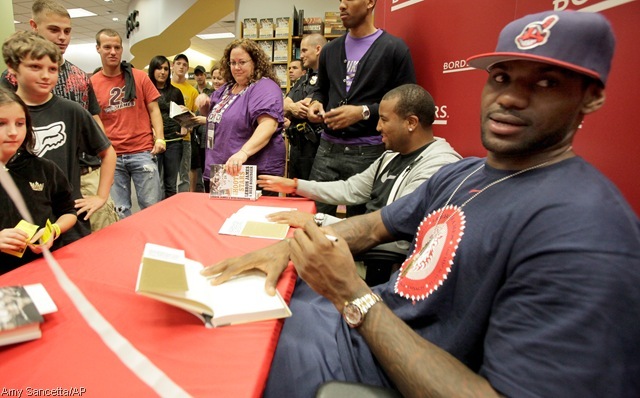 Sidebar 2: LeBron goes all in heads-up with pocket 4Ã¢â‚¬â„¢s? If IÃ¢â‚¬â„¢m ever heads-up on Pokerstars with Ã¢â‚¬Å“Reallebron,Ã¢â‚¬Â IÃ¢â‚¬â„¢m calling the King on everything, man. Back to the matter at hand, the significance here is the second hip-hop video in about a month that featured LeBron. I realize hip-hop songs since the beginning of time have made reference to Jordan, but even Jay-Z has stopped that comparison and has moved on to LeBron. JordanÃ¢â‚¬â„¢s sneakers are still king in the Ã¢â‚¬Ëœhood, but LeBron is quickly becoming a hip-hop icon without having to put out some lousy rap album. So thatÃ¢â‚¬â„¢s where weÃ¢â‚¬â„¢re at. Not only is LeBron becoming synonymous with the hip-hop community, but heÃ¢â‚¬â„¢s making inroads in Middle America at the same time. HeÃ¢â‚¬â„¢s rocking the suburbs and the streets. IÃ¢â‚¬â„¢ll tell you this: Jordan may be the first billion dollar athlete. But at the rate heÃ¢â‚¬â„¢s appearing in peoplesÃ¢â‚¬â„¢ living rooms Ã¢â‚¬â€œ a month before basketball season even begins Ã¢â‚¬â€œ LeBron James is not far behind.